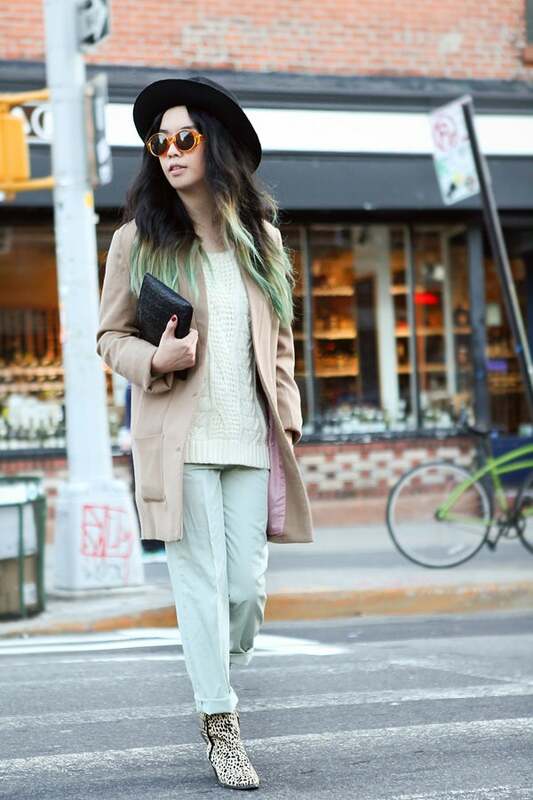 As hard as it is to pull of green hair (and it's, uh, really hard), photographer, Anna Li is rocking the ombre effect with confidence and ease, which is why we couldn't help but notice her strutting her stuff in Williamsburg. The trick here is that she's not letting her bold hair limit the rest of her outfit. Moss and mint might otherwise clash, but, for some reason, the pastel palette of her outfit only highlights the pop of her hair even more (but you already know we dig camel coats). Plus, when you finish off an otherwise rather simple look with leopard booties, orange sunnies, and a perfect black topper, it's hard to go wrong. What do you think of Anna's daring look? As always, tell us in the comments below!